Are you having trouble figuring out which orchid you have? 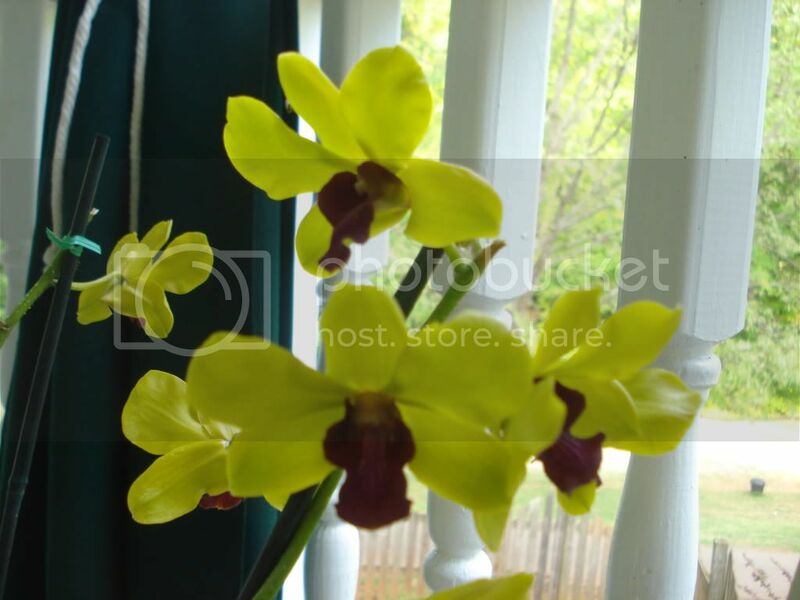 Is it a Vanda, Phalaenopsis, Cattleya, Lady Slippers, Dendrobium, Miltoniopsis, Oncidium? Not to worry this photo identification guide should help you out a little . rosa, Pammie and kdennis14 like this. Ghana O, rosa and kdennis14 like this. Ghana O, Pammie, OrchidNut and 1 others like this. Ghana O and kdennis14 like this. Ghana O, Pammie and kdennis14 like this. Ghana O, sarah2010, rosa and 3 others like this. Thank you for the picture guide! I know that I, for one, was really helped by it. Thank you very much! I'm entirely new at this (orchid growing and being on a forum), so please forgive me if I mess up on protocol. A friend gave me an orchid about a year ago and more recently I received an orchid from my son for my birthday. I think it may be the type that is the last picture on Dave's site. The orchid that I received from my friend (I'm not sure what kind of flowers that it has and so no clue as to the type that it may be) doesn't seem to be doing too well and I don't want the same fate to happen to the one that my son gave me. The older one's base(?) has started to shrivel and the leaves are becoming limp. The new one that I just received also has a shriveled base. Is this normal? What about the limp leaves on the older plant? (Obviously, I haven't repotted it or given it any plant food.) After reading the questions of other newbies, I plan on going out to buy some today. Please give me any other suggestions of how I can bring the older one back and to keep the new one from dying off on me. I took a look at your orchid web page - and wow!! I especially like that your pictures include the entire plant. Many of the orchids I've never heard of; which in my case is not saying much . I'm in love with Papilionanthe (Vanda) Just exquisite. And found the Barkeria skinneri & Bardendrum Nanboh Pixy most interesting. I think because of the plant itself. Dave, what a wonderful site. It's especially good that in some instances you included a picture of the whole plant. Often newbies have plants with no blooms and haven't a clue about what they have. Most sites and books only show the blooms, so they remain clueless. wonderful post. i am waiting for the chance to post as i have not reach 15. haha. keep up the excellent work mate. hi everyone! i think i am very lucky indeed to be here in the philippines, where some of the most beautiful and rarest orchids grow. it is a pity that i was introduced to orchid growing just today! but with you guys around, i think i will do just fine. Hi Dave, the pictures are very nice! Although I wanted to ask...A few months ago I bought a phal from a nursery and it was sickly, I nursed it and fed it and waited to see what the blooms look like. It bloomed a few days ago and then I saw your picture and that's it!! It's the same color combination (white/purple), do you have any idea of a name or anything? Last edited by Cynthia, Prescott, AZ; 07-27-2006 at 01:18 PM. hey, glad to have you in the forum. if it looks like the one in the last picture then it may need water more frequently. the bases "plump" up when they hold water and tend to shrivel when dry. definitely fertilize and try to water more frequently. how much do you water now? what kind of pot/material are they in? thanks for the response, I don't plan on "attaching" a name to it just for a personal name, when I say something I hate saying "you know the white one with the purple lip...," I don't breed either so I'm not particularly worried about that. I water about twice a week, the temps in Galveston have been around 100 degrees and the humidity is high so things dry out very quick. It's in a plastic pot with bark,charcoal, perlite, sphagnum,etc. Thanks for the input guys. 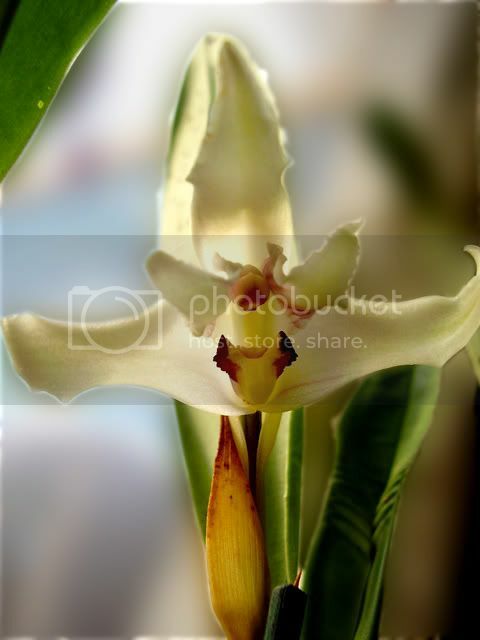 thank you dave...................i now know my orchid is a cattleya..what wonderful orchids. thank you so much. Cynthia, you have a wide collection of orchids! 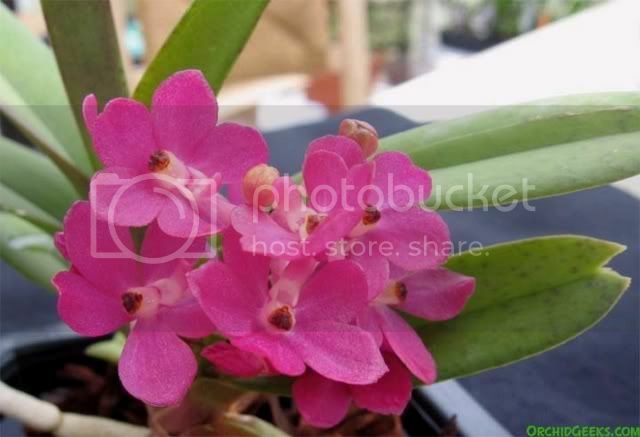 I really like the Papilionanthe (Vanda) teres...would like to add that to my collection. It looks very different from the vandas I've seen. I have a Paphiopedilum Ho Chi Minh, very similar to the Paphiopedilum delenatii. My 4-year old actually saw the Paph. Ho Chi Minh (with two buds...one showing a hint of pink, her favorite color) and told me to buy it. Now, she and I have been enjoying the blooms. Ho Chi Minh is a very beautiful Paph. I have both of the parent species, P. delenatii and P. vietnamense. The vietnamense I bought a couple of months ago as 2 seedlings just a few months out of flask, but they are doing OK, so I have high hopes. Pictures I've seen are a nice red color. Last edited by Cynthia, Prescott, AZ; 08-31-2006 at 11:48 AM. A beautiful collection of orchids. The pics were wonderful! Absolutely gorgeous photos of beautiful orchids. Thanks! These are great. Thanks a million. I Wonder, what kind of camera was used to take the shots? Aaaaawwwww...those pictures of the miltionopsis reminds me of two of my very first orchids that I killed....but i guess I learned from the experience...opting to replace them soon! The Lady Slipper orchids look very similar to some pitcher plants I have seen. Are they insectivorous? Last edited by KathleenToo; 01-23-2007 at 02:30 AM. hey i have 2 plants in my possession(Im a noob) and i would like to know a little more about them! 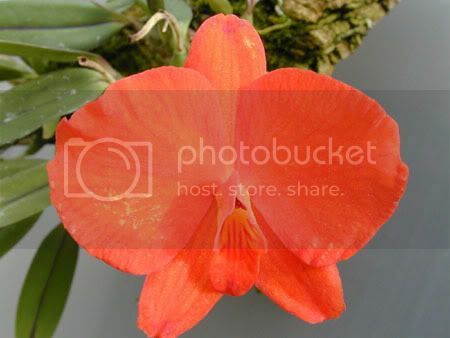 KathleenToo, I don't know of any orchid that is carnivorous. and would doubt any report of one. The pouch acts as a trap for bugs so that they must escape by passing by the pollen and stigmatic surface guaranteeing fertilization. If your plants are babies or immature, you can grow them in less light, but they will need the higher light to bloom. People temps are just fine for these. Perhaps you can see why Phals are considered easier to bloom, as bright indirect light is enough for them. I have spent countless number of hours on the 'net trying to ID some orchids I have. It made it more frustrating since I am new to orchid growing and have no clue in identifying even the most common ones.Most sites just carry the pictures of the flowers and not the plant themselves. Dave's list and Cynthia'a URL are a welcome help. Thanks. I also saw a picture of potted vanda in Cynthia's URL, with all the roots closely interwoven together. Does it mean that Vanda's should not be potted?. I just bought a Vanda kultana yesterday and 'planted' it in a deep metal basket with loosely packed spanish moss around its roots ad with lots of bark at the bottom (a photo is attached). A tray at the bottom , which hangs low , has water in it.Should I remove the material out or at least thin it more? I will appreciate anysuggestions, thanks. Hi. I grow all my Vandas in pots because it is easier for me to do so. If you are growing your Vanda in your home, I highly recommend that you also grow them in pots, as this way you can keep the roots wet longer, which you can't do in a very dry environment. The interwoven roots you saw were probably a picture taken while I was repotting. The roots formed while in a pot, and after that picture was taken, the roots were put back into a pot. I was trying to show how healthy Vanda roots can be growing in a pot. I am sorry I was very foolish in my remark about the roots as I am inexperienced and severly lack knowledge about orchids.. Many bits of info are swirling around in my head and I was thinking of free reign of roots for vandas was suggested everywhere. I remember the roots in the picture of your URL were very healthy and strong but were tightly 'packed'. That prompted me to make that query. I intend to get more vandas and I will try to pot them. But the one in the photo I attached would be acceptable, I hope. I spray warm spring water every day and I have a cool mist humidifier working all the time. Hi, this is the first time I've posted on this board. I have been growing orchids in a fairly 'hit and miss' way for a few years. Because of some life changes I am now taking more of an interest and trying to identify several orchids that I have where the labels have gone walkabout. One in particular I have had for 3 or 4 years and it has never flowered. The foliage is like some of the vanda's on this thread, it is thick and quite course and it has thick white aerial roots. It is a strong healthy plant but never flowered. I have several others that I would like to identify too. If I take some pics and manage to post them on this thread would anyone be able to help me. We can usually identify the family, which should give the cultural requirements for them. But be sure to start a new thread for it, this thread is much too long already. Just got my first 3 orchids, and am very excited to learn about them. I am a total beginner, so please tell me as much as you can. From what I know (by looking it up online) I have one phalaenopsis (moth orchid? ), and two hybrids (oncidium- then something about cambria Beallara,, or maybe cattayla). Please respond if you can help identify them; they came with nothing. I also need some information on how to pot them, water them, and light them. I have spag moss and some gravel or bark I think, and some of the pots have holes. I live in NYC, so all plants are indoors, and the weather is cold right now, but it will warm soon. My windows face west, but I get lots of indirect light in the morning. Thanks ahead of time if you help. Right now I just have a them next to a humidifyer in the shade. Temp around 68. Thanks. 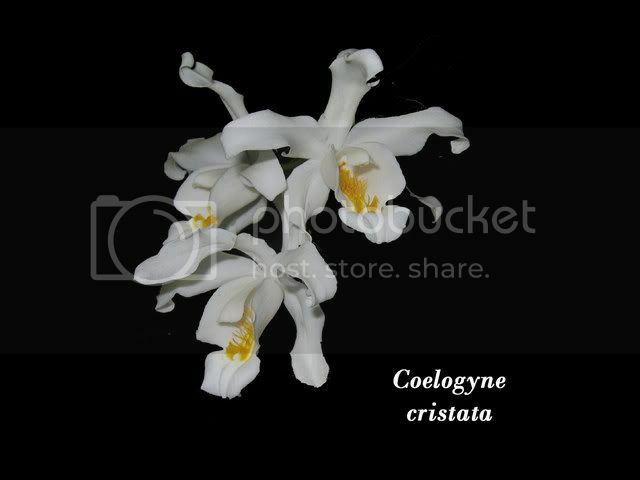 Yes, the first is a Phalaenopsis and the other two are both in the oncidium alliance, often refered to as intergenerics, but this term is not really very good because in reality, there are many other families that produce intergeneric hybrids. None of these should get direct sun, with the exception that if it is filtered to less than 50% light, the Oncidiums could use that. 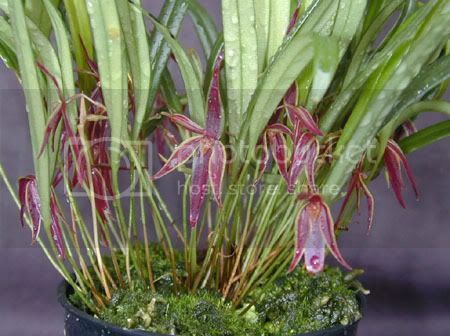 What you want is the brightest indirect light for the Phal, and the Oncidiums will probably do OK with this too. Let these plants get very close to dry before watering. Search on 'Skewer' to find a good method of testing your plants for readiness for watering. 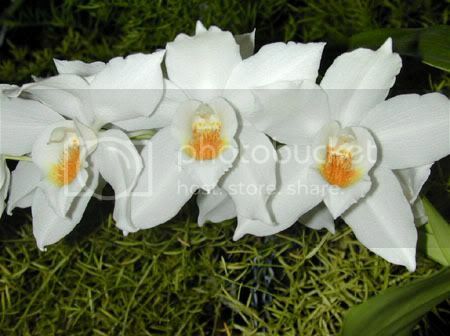 Justlove orchids, it sounds like a nobile type Dendrobium. 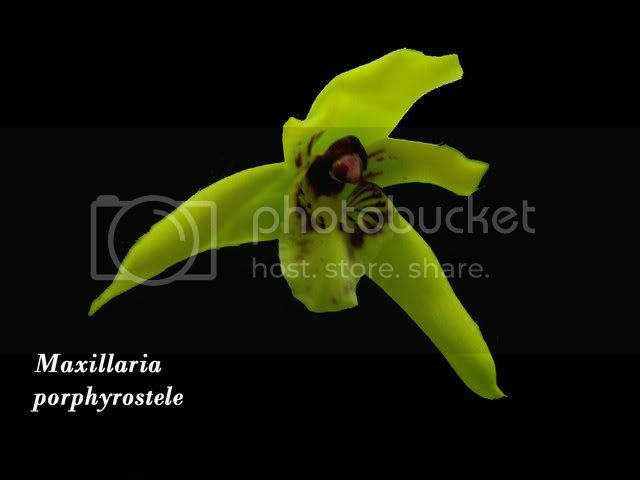 Google on Dendrobium nobile. Cynthia, thank you so much for sharing your pictures; just out of this world. Good choice Fred, the Anoetochilus is Bolero's pic isn't it? Very unique plant. Here is my Rossiglossum grande. I agree, it is a perfect pic for i.d. I have a Phalaenopsis "Moth" orchid. Is there a fancier family name or is that the basic name. The thread here shows pictures for NOIDs and there are a couple of Moth orchids. I thought Phalaenopsis was their ID? You have to forgive me, I've been at this for little over a year now. I have a Phalaenopsis "Moth" orchid. Is there a fancier family name or is that the basic name. 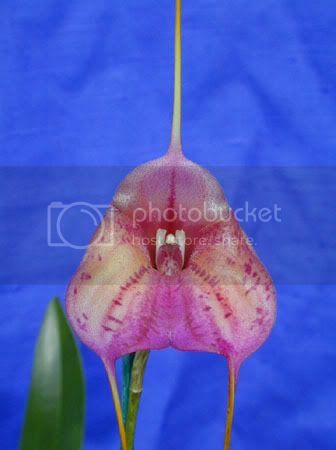 There may be a scientific name if it is a species or a registered hybrid name if it is a hybrod but unless oyu have a tag indicating the name, "Phalaenopsis" which is th ename fo the genus, is about as good as you can get. The name "Moth Orchid" is a common name, not official or scientific, named because someone thought the large petals were reeminiscent fo large moth wings. 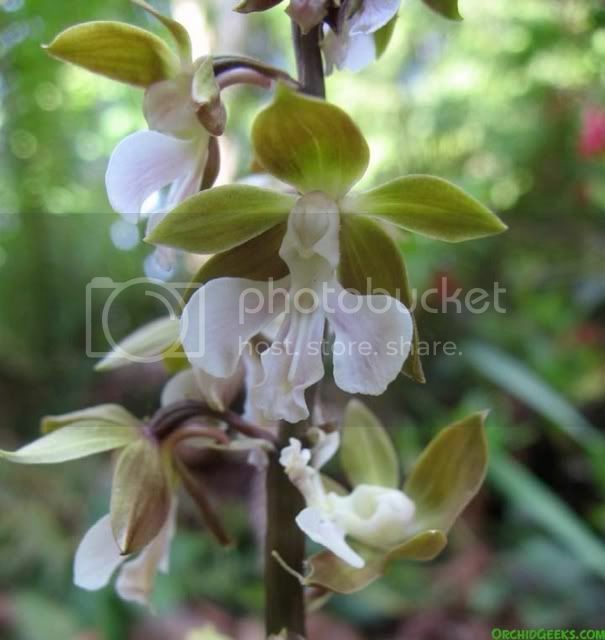 The thread here shows pictures for NOIDs and there are a couple of Moth orchids. I thought Phalaenopsis was their ID? Like I said above Phalaenopsis is the genus of the plant. 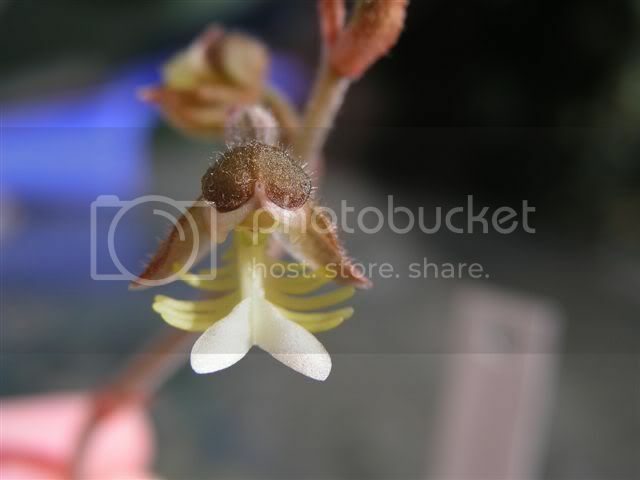 If the species or hybrid name ismissing the plant is still a "noid" even if we do know what the genus is. Hopefully that clears things up a bit. If not take alook at the sticky thread on Orchid Nomenclature found here on the forum. Great pics! This is really very helpful. The term moth orchid exists because, in the beginning, there was only white. That was about the time I started growing orchids 40+ years ago. That is one of the reasons I wasn't much of a Phal grower early on. Well, how many white Phals does one need? Maybe you see my point. Boy have things changed since then. Wow Jenny- You've come a long way, baby!!! The pix of the fleurs are stupendous.... i have three which are out of flower... leafing patterns or pix would also be great. Ascocenda Mary's Lemon Drop. Blooms three or four times a year. Vigorous roots, Grows fast. Thanks for your great info. I have three vandas in bloom and needed this info on how to water.